Each year, our goal for the RAIN Group Sales Blog is to provide you with research, ideas, and insight to help you unleash your sales potential. From regular blog posts to new white papers, ebooks, webinars, and research, we have, and will continue to release valuable insight on what you as a seller can do to set yourself apart from the rest. In case you missed some of our new sales content this year, we've compiled a list of our top 10 most popular content pieces from 2017 that will guide you on your path towards sales success. Sales training is a change initiative. Going through a single class in two days does not change the way sellers sell. Change happens over time, once sellers get back to work and start implementing newly learned skills. For a successful training initiative, you need to support this change. Here are 5 sales training ideas to help you do just that. Too many time-management systems focus too deeply on the activity level—what to do first, what to do next, what the priority order is—without paying enough attention to the bigger picture. The bigger picture starts with understanding how you spend your time, and then considering how you want to spend your time. In this article, we introduce the 4 categories of time, and how you can get more done every day by changing how you spend your time in each category. If you have buyers that haven't responded, you either want them back in the pipeline or out. Pipelines filled with unresponsive buyers frustrate sellers, and kill time and success. You are looking to hear "no" as much as you are "I'm back" so you can focus your time and energy on other things. Here are 5 approaches to consider when you stop hearing from buyers. In our recent Top-Performing Sales Organization study, we were particularly interested in the sales skills that stood out when sellers not only met their goals, but also believed their goals were challenging. Based on our research findings, we were able to determine 5 sales skills sellers need to differentiate themselves from the competition and propel their success to the next level. Ask leaders at companies how much more they believe they could be selling to their strategic accounts and you don't hear 5%, 10%, or 20%. It's usually more like, "We should be selling 2 times…3 times…even more." Ask what's in their way and you'll often get this answer, "Our strategic account managers just aren't doing what they need to do to penetrate the account, cross-sell, and keep the competition out so we can truly grow our accounts to their potential." Here are six distinct roles that must be played in an organization for strategic account management initiatives to deliver at peak potential. Too many sellers have lots of opportunities in their pipelines that shouldn't be there. Neither managers nor sellers want mirage pipelines with visions of promised lands that simply aren't there. Here are 4 tips you can use to clean up your pipeline. 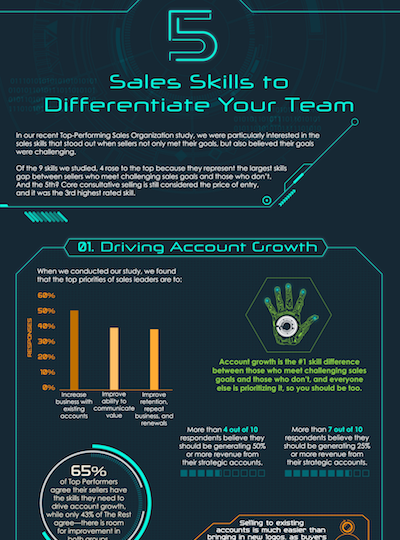 Having a highly-motivated sales team is essential if you want to see consistent sales results. As you think about the motivation of your sellers, don't think just about money as a motivator. Consider these 5 key influences on sales motivation and how you're doing in each area. You hold the keys to your sales success. Competitors don’t win because their offerings are more impressive. They win because they deliver a superior sales experience. You can too. 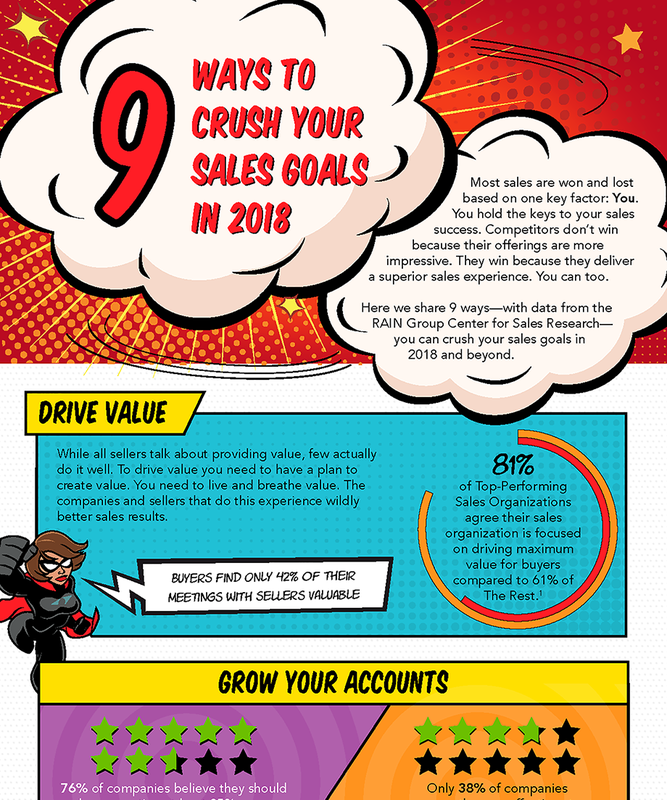 In this infographic, we share 9 ways—with data from the RAIN Group Center for Sales Research—you can crush your sales goals in 2018 and beyond. Ask someone in the presence of other people if their organization drives value for their customers, and they'll say yes. Ask them confidentially in a research study, and you'll get a wholly different answer. Everyone says value makes a difference in sales and business results. Indeed, the most successful sellers and sales organizations focus on value. If you want to know what driving value really looks like in an organization, and specifically how you can drive value in your own, this research report is a must read. 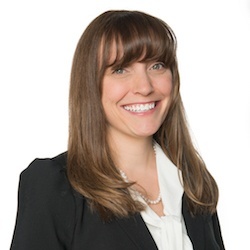 According to a recent study from the RAIN Group Center for Sales Research, 55% of leaders at companies don't believe their sellers have the negotiation skills needed to consistently win new business. 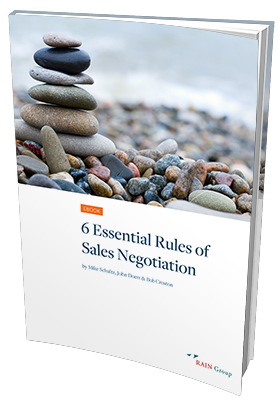 In this ebook and webinar, we share the 6 Essential Rules of Sales Negotiation, a core framework that helps sellers achieve tremendous results with all types and sizes of sales negotiations. If you're looking to negotiate the best solutions, win sales at favorable pricing and terms, and enhance the strength of your relationships, these two pieces of content are essential. We hope that you enjoy this content, and that it helps you on the way to achieving your sales goals. We look forward to bringing you much more this year, so stay tuned.